The public loves anniversaries. For historians interested in disseminating their research to people outside of the academy, anniversaries are “teachable moments.” The centenary of the Federal Reserve, which was created in 1913, is certainly turning into such an occasion. For instance, the Cato Institute’s blog will be hosting a discussion this month about the Fed’s performance over the century. This discussion at Cato Unbound has already begun with a lead essay by Gerald P. O’Driscoll. The blog will soon post Reaction Essays by Lawrence H. White (6 November); Scott Sumner (8 November), and Jerry L. Jordan (11 November). All of these authors are libertarian, which is to be expected, since it is a Cato blog after all. I was, however, disappointed by the fact that none of these four authors are economic historians or historians. Perhaps Cato could have tried harder to find a libertarian historian or political scientist capable of writing about this topic. Doing so would have injected a more interdisciplinary element to the discussion. Richard E. Sylla, Henry Kaufman Professor of the History of Financial Institutions and Markets at New York University’s Stern School of Business, has recently released a list of the top six leaders in the history of the Fed. Sylla’s list includes William G. McAdoo, Benjamin Strong, Marriner Stoddard Eccles, William McChesney Martin, Jr., Paul A. Volcker, and, of course, Alan Greenspan. Personally, I think that Strong was the most important of these individuals. Strong had a very good working relations with his counterparts in the world’s other major central banks. (He was very close to Montagu Norman at the Bank of England). 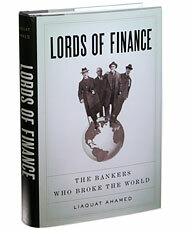 As Liaquat Ahamed has demonstrated in a recent work of popular history, Strong’s untimely death in 1928 created a vacuum and made it difficult to coordinate an international response to the bank failures that followed the Crash of 1929. Although there are dangers in attributing too much importance to individuals in financial history, or indeed any branch of history, I think one can support the thesis that Strong was an important player and that his premature death had a greater social impact than, say, the death of Warren Harding.